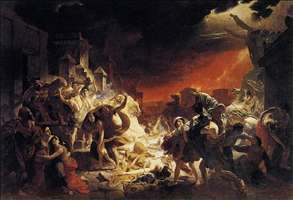 Karl spent part of his life in Italy (1822-34 and 1849-52), where he painted his chief work, The Last Day of Pompeii, inspired by a performance of the opera of that name by Giovanni Pacini. An enormous (6 m wide) melodramatic composition, it brought him European fame and inspired Edward Bulwer-Lytton s novel The Last Days of Pompeii (1834). See more details about "Last Day of Pompei"